High performance foam corner protectors. Standard sizes or made to suit. 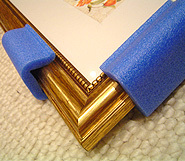 Self adhesive backed foam corner protectors. Standard sizes or made to suit. 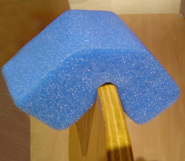 Triangular folding foam corners in 3 sizes. Plain of self-adhesive backed. A 25mm thick light & versatile corner protector offering end and face protection for panel and window products. 30mm thick light & versatile corner protector offering end & face protection for panels, glass & windows. 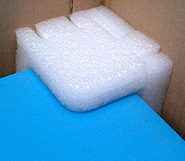 High performance foam U shaped corner for protecting heavy items. Supplied in a pop up, folding for easy storage. 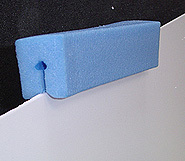 Small High Performance foam corner protectors. Standard 20mm material, alternative sizes available to order. 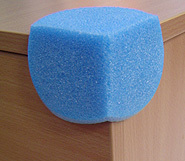 Low cost foam corners, 3 sizes available. Versatile and easy use, next day delivery. High performance edge protection for heavy products. High density available in standard lengths or cut to size. 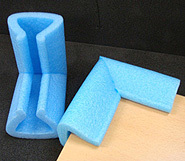 Foam L section, lightweight, pliable and easy to use available cut to size. Low prices & next day delivery. Excellent transit cushioning for glass, metal and delicate panel products. 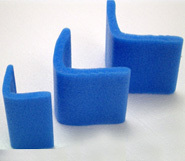 Foam u section available in 8 sizes. Lightweight, pliable and very easy to apply. 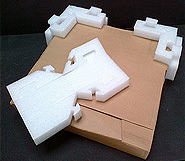 Fully bespoke L shaped foam corners made to order in any size or thickness.